1. Start by placing a level crossing on the baseboard. 2. Place an invisible level crossing nearby (behind and to the right of the visible level crossing in the following picture). 3. Place a level crossing controller on the map (visible in the distance behind the invisible crossing in the following picture). The invisible level crossing has been moved to make a little more space to work in. Note as well that the arrow on top of the level crossing controller should point towards the invisible level crossing. 4. A close-up view of the level crossing controller. 6. 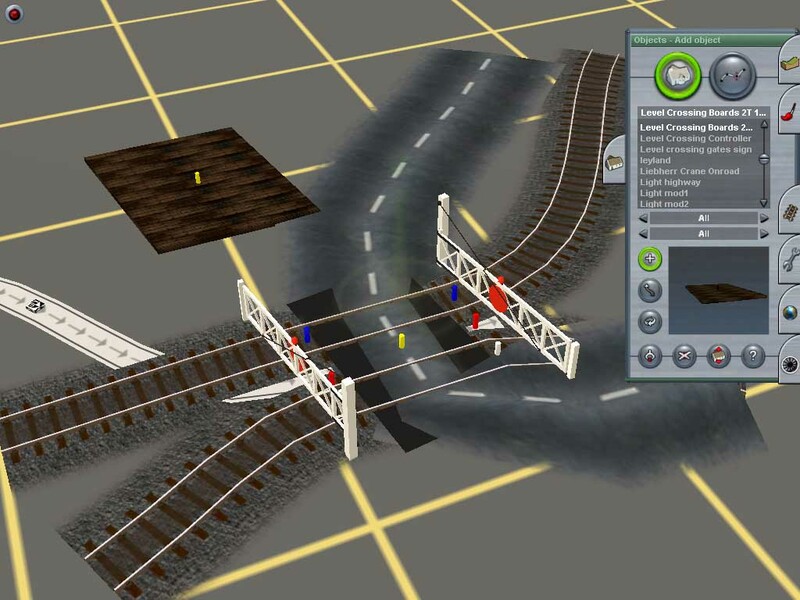 Add another length of invisible track to the left of the level crossing controller, and form a junction with the previously laid track linking the controller to the invisible crossing. 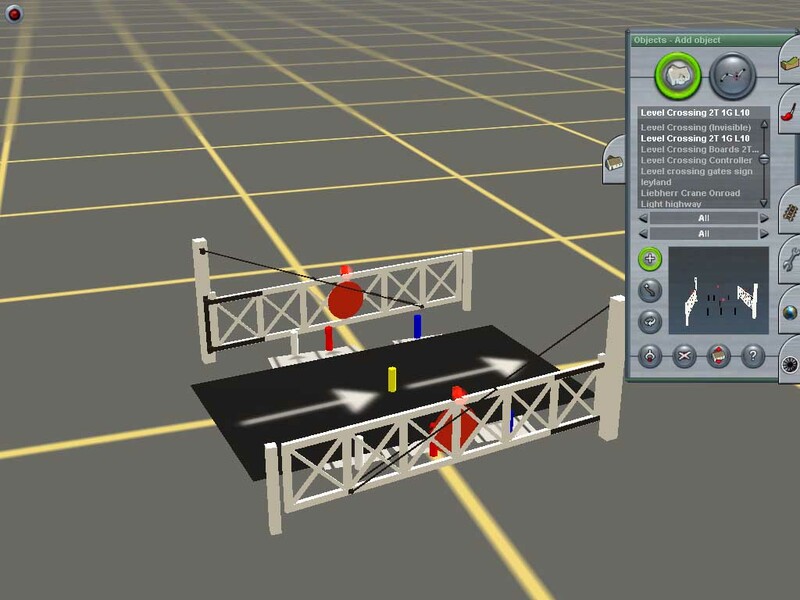 If there are two or more nodes between the crossing controller and the invisible crossing, make the junction at the node nearer, or nearest, the invisible crossing. Trainz will normally add a junction lever automatically. 7. 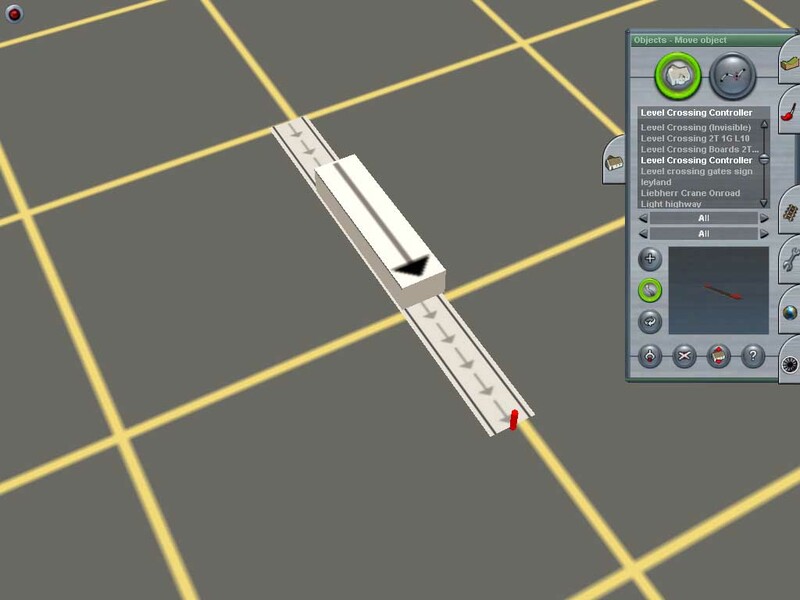 The lever automatically added by Trainz will be visible in Driver sessions, so delete it and and replace it with an invisible junction lever. The invisible level crossing can be moved out of the way if more space is needed to connect tracks and roads. 8. Give the level crossing a name. This can be anything you like (within reason - Trainz does have limits on the name length and the characters that can be used). For this tutorial, we'll give the crossing the name Crossing Name. 9. Give the invisible junction lever a name. The SD3DVM level crossing is scripted to operate a junction lever whose name is formed by appending a space and "(Control)" to the end of the crossing's own name - so, in this example, the invisible junction lever is named Crossing Name (Control). 10. 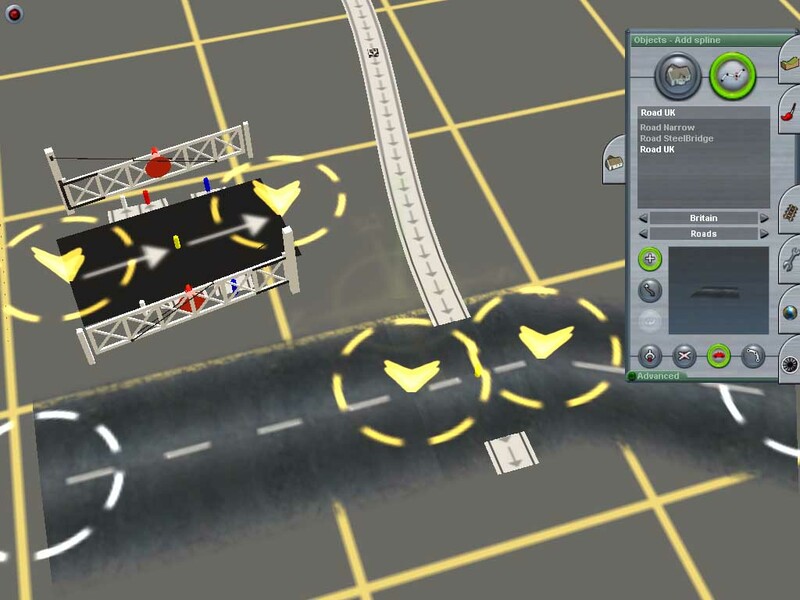 Attach roads to the invisible crossing (if you haven't done so already). There's no need to put them into their final alignment just yet. 11. Attach rails to the visible crossing. As with the roads you just attached to the invisible crossing, there's no need to put in their final alignment just yet. 13. Place level crossing boards near the visible crossing. 14. Move the crossing boards on top of the level crossing itself, using use the yellow marker pillars to ensure correct alignment. 15. Finally, straighten out the road and rail splines to complete the scenic effect.. The visible level crossing responds to the approaching train by starting to close. 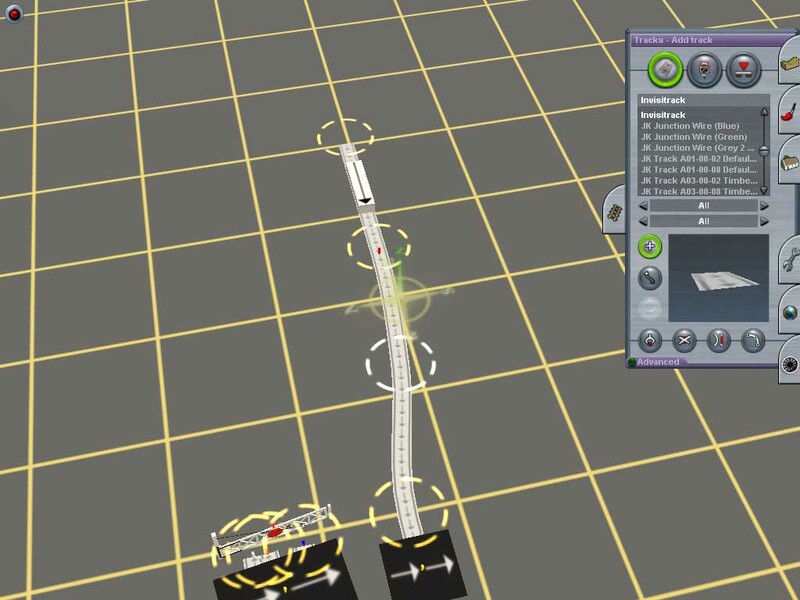 The visible level crossing is scripted to switch the invisible junction lever (which it identifies through the names given to the crossing and the lever) to the right. The level crossing controller has a dummy wagon placed on it (this is the box with the arrow on the top). This now has a path set over the invisible level crossing, which responds by closing. In turn, this stops the traffic on the road attached to the invisible crossing. The invisible crossing coincides with the visible crossing, so that the effect is to stop traffic going over the visible crossing. After a short delay, the visible level crossing closes each gate in turn. The train crosses the level crossing. When the train has passed down the line, the visible level crossing starts to open. The script opens each gate in turn. When both gates are fully open, the level crossing then sets the invisible junction lever to the left, so that no train now seems to be approaching the invisble crossing. The invisible level crossing responds by "opening", allowing road traffic to restart. 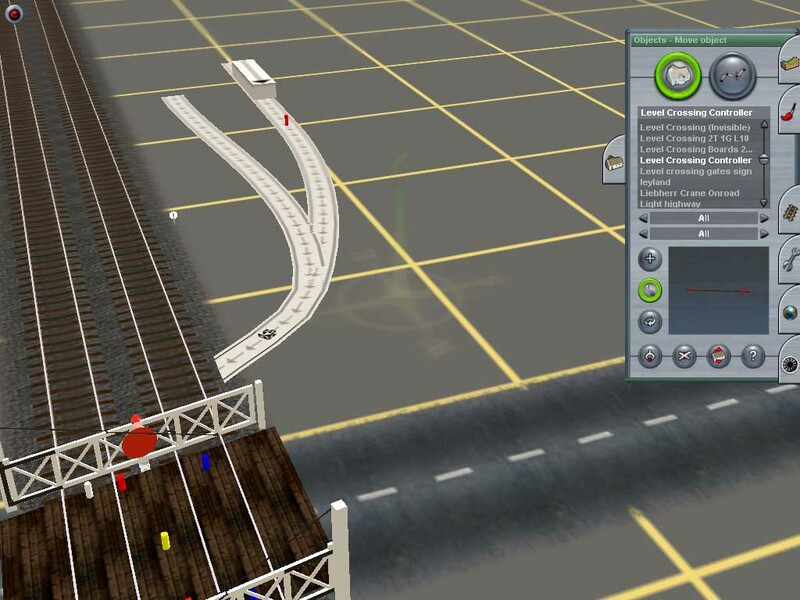 Both the visible level crossing and the level crossing controller are scripted (the invisible level crossing and the invisible junction lever aren't, the only thing special about those components is that they, along with the level crossing controller and the invisible track, disappear in a Driver session). 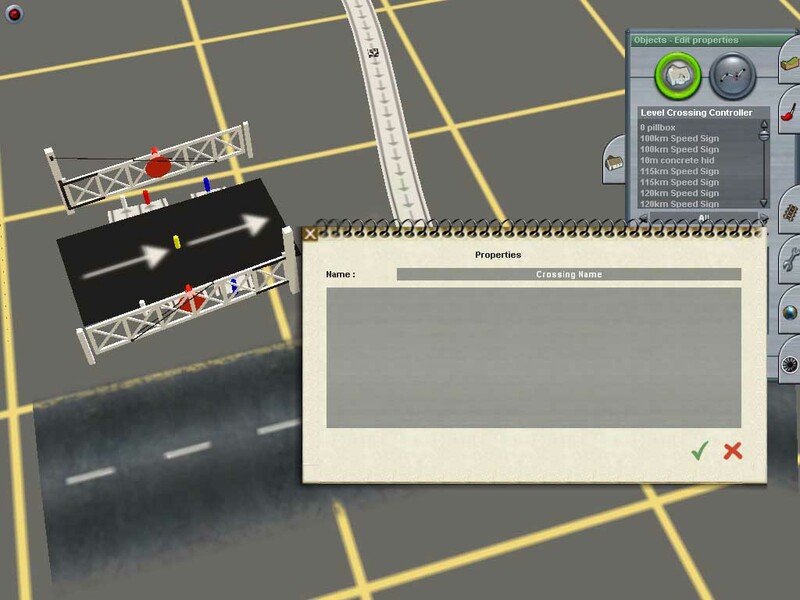 The visible level crossing script animates the level crossing gates and also switches the lamps on top of each gate off when the gate starts to move and back on when the gate has opened or closed fully. I haven't found a way of keeping the lamps shining as the gates move, or at least I haven't found a way of doing this elegantly and without making the computer do a lot of work that doesn't add that much to the visual effect. 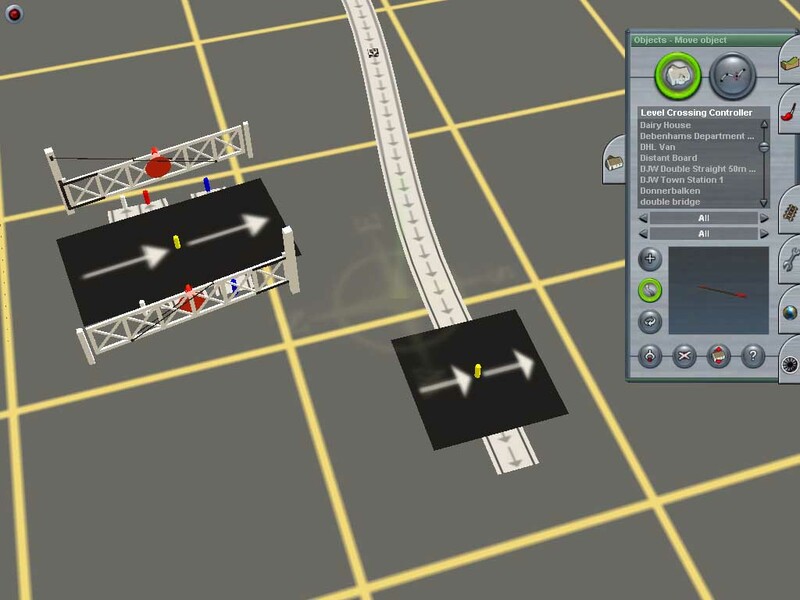 The script also switches a junction lever, which it locates by matching its own name with the junction lever name, to make it appear to the the invisible level crossing that a train is on its way. The names of the visible level crossing and the invisible junction lever must match, otherwise the crossing won't be able to find the lever. If the crossing is named "Name", then the junction must be named "Name (Control)". Get is wrong, and road traffic won't stop when the gates close, but will just drive through the gates and into the path of trains. If the level crossing controller is too far from the invisible level crossing, the invisible crossing might not recognise the dummy wagon as an "approaching train", so that it fails to close, and road traffic will not stop when the gates close. This can be cured by moving the controller nearer the invisible crossing. 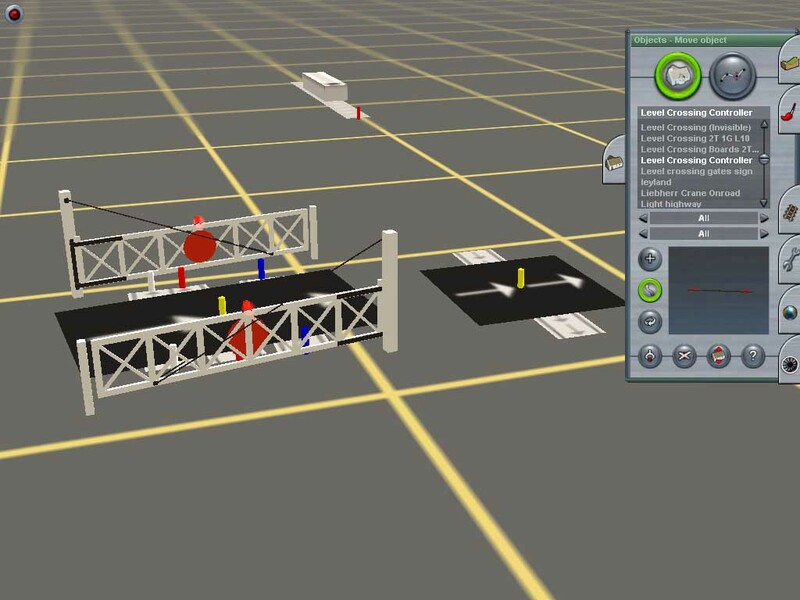 If the junction operated by the invisible junction lever is too close to the level crossing controller, then the presence of the dummy wagon on the crossing controller might stop the junction lever from moving, and road traffic will not stop when the gates close. This can be cured by moving the junction further away from the controller. 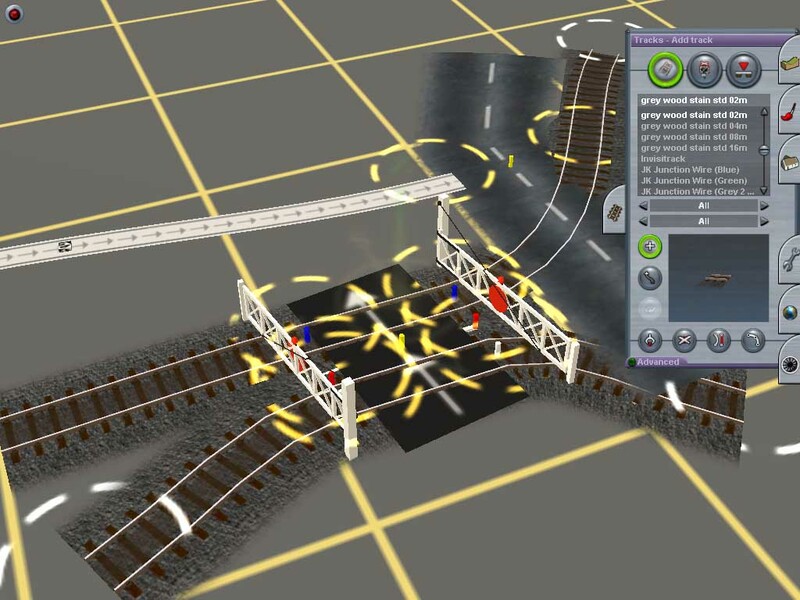 If there are insufficient nodes in the invisible track linking the level crossing controller to the invisible level crossing, there might be problems moving the junction lever or junction node to deal with the previous problem. Either include at least two nodes between the controller and the invisible crossing when first building the crossing (making the junction at the node nearer the invisible crossing) or delete the level crossing controller, move the junction, and place a new level crossing controller. On one occasion during testing, the level crossing script gave errors when attempting to animate the gates or switch the invisible junction lever. This appears to be caused by moving or replacing the level crossing controller or the invisible junction lever. Closing Trainz and restarting it resolved this problem. If the road is attached to the visible level crossing, then traffic on that road will stop when the gates close, but drive through the gates as soon as they start to open. 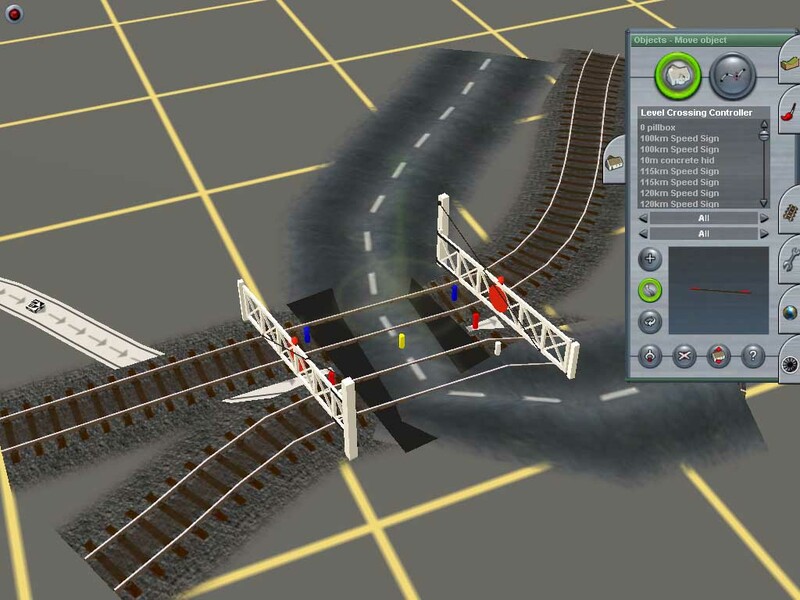 (There is no problem to using the SD3DVM level crossing on its own, without using any of the invisible level crossing, invisible junction lever, or level crossing controller assets provided that any road attached directly to the crossing does not carry traffic, otherwise the sight of cars driving through opening gates will be quite disturbing! ).